Sous-vide (/suːˈviːd/; French for “under vacuum”) is a method of cooking in which food is placed in a plastic pouch or a glass jar and cooked in a water bath or steam environment for longer than normal cooking times (usually 1 to 7 hours, up to 48 or more in some cases) at an accurately regulated temperature. The temperature is much lower than normally used for cooking, typically around 55 to 60 °C (131 to 140 °F) for meat, higher for vegetables. The intent is to cook the item evenly, ensuring that the inside is properly cooked without overcooking the outside, and to retain moisture. These two sausages follow the same story of Knack and Knock. They are almost the same and sometimes called by the others name. We made both and I will show both recipes here. Bill’s notes: I will only make 5 lbs of Bockwurst so all ingredients will be cut in half. Since all the sausage recipes will be made on the same day, it will be easy to combine and then divide the eggs. Ingredients for 10 Lbs. 2 cups of whole milk 5 b. Salt 2 Lb. powdered dextrose 1 Tb. Mace 1 Tb. Ground celery 4 Tb. Onion powder 1 Tb. Ground white pepper 6 pcs. fresh chopped chives or green onions 6 pcs. Chopped parsley 1 piece grated lemon peel 3 fresh whole eggs 3 lbs. boneless veal 5 lbs. lean pork shoulder 2 lbs. pork trimmings GRINDING Grind all the meat through a 1/4″ grinder plate, adding all the ingredients, and mix. Place in food processor and emulsify. STUFFING AND COOKING Bockwurst is stuffed into a 24-26 mm sheep casing and made in links 4-6 inches long, then hung on clean smokes-ticks. (Do not use a smokestick that can stain the casings, as bockwurst is a white sausage.) Sausage should be placed into the cooker or water and cooked until the internal temperature reaches 152° F. (Be sure the water temperature is not above 165° F). Place cooked sausage under cold shower for about 10 minutes to reduce internal temperature to 100° F and remove to cooler overnight. This sausage also can be frozen and cooked as it is needed. Bockwurst also is made as a very fine-textured sausage (emulsified) in the Western New York area. It is very popular at Easter time and also goes under the name of “white hot dogs”. Ingredients for 10 Lbs. 5 lbs. veal 5 lbs. lean pork butts 1/2 cup non-fat dry milk 4 Tb. salt 1/2 cup soy protein concentrate 1 tsp. onion powder 1 tsp. dry parsley 4 Tb. ground mustard seed 1 Tb. ground white pepper 1 tsp. ground celery seeds 1 tsp. mace 3 Tb. powdered dextrose 4 cups ice water Grind meat through a 1/4″ or 3/8″ grinder plate. Add all the ingredients except the water and mix thoroughly until evenly distributed. Do not pack soy protein concentrate when measuring. Then place the meat in the food processor, adding water as you go, to help emulsify the meat. Stuff into a 32-35 mm hog casing and make into 5″ to 6″ links. Place into 160° F water and cook until an internal temperature of 150° F is attained. Then shower the sausage with cool water until the internal temperature falls to 75° F. Place in cooler overnight before using. After the casing had been filled and twisted I needed to cook them in a water bath. Since already had a souse vide that will maintain a water temp +- 1.2 degree I opted for that route. It’s here that I watched all the links untwist and casing get ugly, but you should remove the casing from both of these sausages before serving. Finishing up on a bed of sliced potatoes, onions and mushrooms, Francene is not a sauerkraut fan. Of the two, we prefer the Bockwurst. The Weisswurst has less flavor and more of a dry hamburger texture. I wouldn’t throw it out though. It’s still good eats. Don’t forget the hot, sweet mustard. The smell of bratwurst sitting on a bed of grilled sauerkraut and onions brings back memories that it seem like yesterday. We were sitting in the little cafe on the Danube River, the Wurstkuche Restaurant in Regensburg, Germany, also known as the Sausage Kitchen, eating our lunch. My Dad showing us these lines on the wall that were high water marks from flooding of the Danube, a stone’s throw from the restaurant. This was just a cafe to have lunch, not yet known as the oldest continuously open public restaurant in the world. No, this wasn’t yesterday, it was 1955 and I was 8 years old. Captain Dudley Jones, stationed at Regensburg, Germany, the year 1955, had been joined by his family, wife Billie and two sons, Skip and Little Bill; and along the way we added another member, Reuben, a full sized long haired Dachshund. It must have been a Sunday, and we drove across the bridge for some sightseeing. We lived in a house across from the river from St Peter’s Cathedral. The picture I have included of the Bridge and Cathedral is almost the same as the painting my parents’ commissioned. There are memories that just stay with you. Some 20 years ago I watched a travel documentary and the scene is from inside this restaurant. They are showing the high water marks from the Danube flooding and I excitedly start babbling, “I have eaten there! I have eaten there!” Then the cameras went outside and I knew I was right. So I have decided it’s time for a good German sausage dinner. with real sausage, not stuff with something like Wilshire Farms on the label. Authentic German Sausage recipes made at home, eaten at home, and does it get any better than this? Yes, it does, but I don’t have the cash to fly over to Germany for lunch, so this will have to do. Leftovers, no, not leftovers again. Ah, Sous Vide leftovers. Those dreaded leftovers, if they are a casserole or maybe a stew, chances are they will better on day two, All that time for the flavors to meld and get yummy. But it’s not stew, it’s not a casserole, it’s a great T-Bone steak that was cooked to perfection, and I mean perfection. What are you going to do, how are you going to destroy that perfect rare steak. Well, you could eat it cold, maybe slice it and have a beef sandwich, but no. You want to eat the rest of last night’s steak, and you want it just as good as it was last night. In all my years I have never found a way to have that steak as good tonight as it was last night. Until now. The closest I ever came was to heat my panini pan and lid over heat till it smoked, turn off the heat, place the steak on the pan, then the lid on steak and wait till it stops sizzling, about 2 minutes. You now have a steak, warm inside and marginally more cooked on the sides. Good, but not the same. Enter right, Joule, a sous-vide * see definition at end of article unit that will save the day. Now the internet and YouTube are full of sous-vide demonstrations, showing how it cooks the perfect steak, as well as countless other things. How this perfect 129° steak, ugly to look at is just the best meat you have ever eaten. Throw it on the grill for a minute each side and use a blow torch to crisp the fat on the edge. Now you have a steak that is also beautiful to look at as well as yummy to eat. But with all the articles and videos, I haven’t seen that leftover steak brought back to 129° and not overcook the meat until now. We did the Joule thing to two great T-Bones, but I should have just done one. Too much food. So I vacuum-packed the two left over steaks and stuck them in the fridge. Sort story, shorter. Next evening I heated the water, immersed the steaks, and thirty minutes later served them. I couldn’t tell the difference between the two night’s steaks. Each tasted just the same. Now on the other hand, the broccoli and greens didn’t fair as well. But in the end. Two great nights of steak without night number two being a leftover night. Once limited to the pros, sous vide (pronounced sue-veed) is a cooking technique that utilizes precise temperature control to deliver consistent, restaurant-quality results. High-end restaurants have been using sous vide cooking for years to cook food to the exact level of doneness desired, every time. The technique recently became popular for home cooks with the availability of affordable and easy-to-use sous vide precision cooking equipment like the Anova Sous Vide Precision Cooker. Sous vide, which means “under vacuum” in French, refers to the process of vacuum-sealing food in a bag, then cooking it to a very precise temperature in a water bath. This technique produces results that are impossible to achieve through any other cooking method. To sous vide or not to sous vide, well for those in a hurry and don’t want to read this great story, the answer is YES. 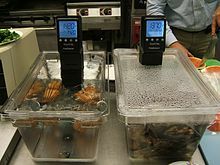 To understand what sous-vide is just type in sous-vide in any Google search and prepare to read about the swarm of new experts that will try to make the Wikipedia article sound originally theirs. In a nut shell, it is low temperature cooking in a water bath with the food sealed in a vacuum pouch for extended periods of time. Now I’m no expert, my brother, Skip asked me about it a year ago and I didn’t have a clue but when I read up on it I wasn’t impressed. I know how to cook a steak. Then my son, Trevor, a sous chef told me he just bought one, I read up more and after a bad experience with a Tri-Tip, I purchased one. The sous-vide method cooks the food at its optimum finished temperature and without fear of continual cooking after the food has been removed from the heat. 129° is just that 129°. It also means that the food can sit in the water bath for a while after the perfect cooking has taken place. A note of caution here, the long periods of time help the meat fibers break down so your steak is more tender than if just cooked over a flame. But you can break down too much fiber and end up with a steak you can cut with the back of a spoon, yuck. My son purchased the Anova and loves it, My brother and I purchased the Joule from ChefSteps. The joule has more power, 1100 watts compared to the Anova’s 900 watts of power. But both do the same job in the same amount of time once the water temperature has been reached. The Anova is available bluetooth or wifi for using the app to control cooking. The Joule is wifi only, and has probably the best app available. The latest upgrade includes not only the recipes but what to expect if left in the water too long. The Joules’ greatest weakness is that you need the app to use it, where the Anova can be turned on by a temperature set via buttons. The T-Bone steak pictured here has been pre-seasoned with a small coating of ghee between the meat and spices (salt and pepper with a little savory). The ghee could be any oil or butter, very sparsely used only to hold the salt off the meat until cooking starts. If you follow the picture story I have here, you will see that the great steak (a 1 1/2 inch T-Bone) looks pretty sad after it has been removed from the bath. I used a propane torch to sear the fat and Lodge’s Panni pan set. Lodge makes some of the best cast iron cookery available and their enameled coating is as good as any other I have seen. On the subject of enameled cast iron, this stuff, if taken care of, will serve you, your children and then your grandchildren. The two middle sized dutch ovens I use are made by DescoWare of Belgium. At the end of it’s life the DescoWare trademark dropped and the rights and formulas for the patented enamels were sold to Le Creuset. Mine were handed down from my grandmother to mother to me. Put pan and lid directly over the highest flame or temperature setting. When they start to smoke turn the heat off, put your steak in the pan and set the lid on top. Finally, get a small fan to clear the smoke detectors. When the sizzling ends or after 2 maybe 3 minutes remove the steak and be wonder struck. You now have a steak as good and probably better then you will find in a high end steak house. Cooked perfect top to bottom with a beautiful sear on the surface. We served it with roasted Brussels sprouts. Cooking the steak as I have outlined here shows what can be done with a sous-vide. The turning point in my deciding to buy the sous-vide was a six pack of Tri-tip I purchased from Smart Foodservice. The Tri-Tip was my first cooking experience with the sous-vide, and it was just wonderful. Tri-tip is oddly shaped and varies in thickness, I have cooked more that I can remember and the best were usually seared then baked to TRY to get an even cooking to no avail, Tri-tip also isn’t known for it’s buttery tenderness. The sous-vide version was wonderful, perfectly pink on both ends, seared on the BBQ over a flame for a minute on each side. I then tried to cook a couple of whole artichokes and after the recommended time the heat sealed bag had unsealed and the artichoke wasn’t even close to being cooked (185° water bath), and I had to put it in the pressure cooker to finish. So where the sous-vide may have its place; it won’t replace everything in the kitchen. Just wait till I tell you about the 1 1/2 inch pork chops finished with a drunken hazelnut crust. We all love a bargain, I especially love a great bargain when it comes to steak. The holidays always bring out the good sales and this Labor Day has been no exception. When I can save over 50% of the retail price for something I would buy anyway, I go for it. We all can go look through the prepackaged product, make our selection and enjoy. But what you need to know is the butcher. You don’t have to be friends, have him over for dinner or even know his/her name. You need to know how to be polite and let them know you appreciate their trade. Many a time when making a selection I will ask them to point out the item they would buy, and if it looks as good as what my selection would have been, take it. The butcher will remember you. If you are a jerk, they will remember that as well. So, my choice option was either a 4 precut family pack on the shelf, or to ask the butcher to take care of me. I chose the latter. In Oregon it seems that the steak name, Porterhouse, is no longer used, as they are all T-bones. So I asked the butcher to cut me 8 steaks, 1 1/2 inches thick with as large of a loin as possible (Porterhouse’s). I came back 10 minutes later (always let them know that they can take their time) and picked up what I have shown here. Now these are big steaks, but a slow cooked thick steak will always be tastier than a thin steak, and these are big enough that my wife and I will only cook 1 and share it. Okay, 8 big steaks, what’s next. If you’re like most of us, you will have to freeze the meat for future use. Between my brother and my son, I have been introduced to Sous Vide, the act of cooking under vacuum. I was a doubter until I tried it, and have changed into a supporter. Now some claim that Sous Vide can cook everything, well it might be possible but I still enjoy many other methods. What I am doing is freezing each steak as if it is to be Sous Vide. This is preferable to defrosting and then repackaging. If I choose to throw the steak on a hot cast iron skillet and finish in the oven, or toss it on the grill or cook it in a wood pellet grill/smoker I can. The meat will be ready to go with some salt and pepper on it. First, I chill the meat till solid and brush with a thin coat of ghee, this will possibly add a sweet butter taste or not. I don’t really care for everything buttered. But what it will do is provide a layer between the salt and the meat helping to preserve the natural juices and moisture already in the meat. I only started doing this since I started packaging it as if the product will be cooked via Sous Vide. So now I have added 8 beautiful steaks and 4 packs of 4 each Tilapia fillets. This puts you ahead of the game, good food and good cooking shouldn’t be rushed but you can shorten the time to prepare a great meal by prepping ahead of time.